Historically, liquid bleach has been used for cleaning wood, especially when mold, mildew, and algae are involved. 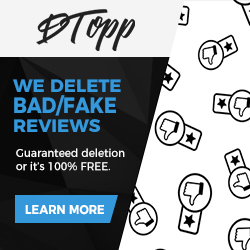 In recent years, however, the once easy-tochoose solution has been complicated as we balance on onslaught of customer concerns, new products on the market, and overall information years. Before we can begin talking about cleaning wood and killing mildew and algae, we need to talk about safety. Those who have been in the business for a while should understand what chemicals you can and cannot mix together. We know not to mix any form of bleach with brighteners because this combination essentially creates mustard gas. Additionally, beware of chemical interactions if you are buying pre-made cleaners, strippers, and brighteners. Some brands use “cleaner” and “stripper” interchangeably. Typically, when I hear “cleaner,” I think sodium hypochlorite or sodium percarbonate, and when I hear “stripper,” I think sodium hydroxide. However, I have found at least one “cleaner” that contains sodium hydroxide. There are also cleaners that use oxalic acid which is used in brightening. We definitely wouldn’t want to mix bleach with these cleaners. My advice: when you are using a two-step cleaning process, use products manufactured by the same brand, and read the labels to understand what each product is used for. The chemistry for a given brand is made to work together (although this doesn’t necessarily mean you will get the results that you want). Finally, unless you are looking for trouble, do not alter these premixed solutions. There are predominately three types of cleaners in the market place. 1. Liquid bleach (sodium hypochlorite) based cleaners. These formulas include a surfactant (soap) to help with the cleaning process because bleach is not a cleaner. Mild scrubbing is required with these cleaners for best results, and they can be either rinsed off with a hose or with light power washing. 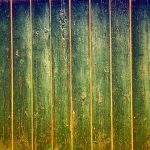 In recent years there has been much debate over using liquid bleach on wood because it has been found to destroy wood’s lignin (the glue that holds wood together). If left on wood too long, or if too strong of a concentration is used, the solution can damage the lignin resulting in fuzzing, further degradation of the wood, and ultimately poor stain adhesion and failure. Bleach can also eat away and rust nails and screws in your wood. 2. Oxygenated bleach (sodium percarbonate). These formulas have a fizzing action that help lift and loosen dirt and contaminants embedded in wood without the need for scrubbing. These are powder-based products that require mixing and have a limited lifespan once mixed. These cleaners are not harmful to wood, and in recent years they have been regarded as having the best cleaning results. 3. Oxalic acid. Essentially, these formulas are designed to accomplish both cleaning and brightening at the same time. Which type of cleaner is best? 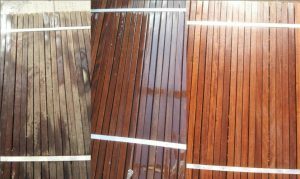 For starters, if I am working on a deck that has a prior stain that is either latex, acrylic, alkyd oil blend, or a harder coat oil based that needs to be removed, I am not necessarily worried about mildew and algae on the surface. I am using a sodium hydroxide stripper, which will not only take off the old stain, but in most cases resolve the mildew/algae issue. If it doesn’t, I can come back and spot treat as needed with a bleach solution and rinse thoroughly afterwards. The unfortunate reality is that we may not even spot treat if needed after the application of stripper. We are slowly learning to move to sandpaper after the first application of stripper, as many stains are becoming increasingly harder to remove. More and more, we are simply using strippers to remove as much of the stain as possible to reduce how much sanding we need to do. Mildew and algae don’t stand a chance against some good old fashioned 80 grit. This pictures is a good example of this application. 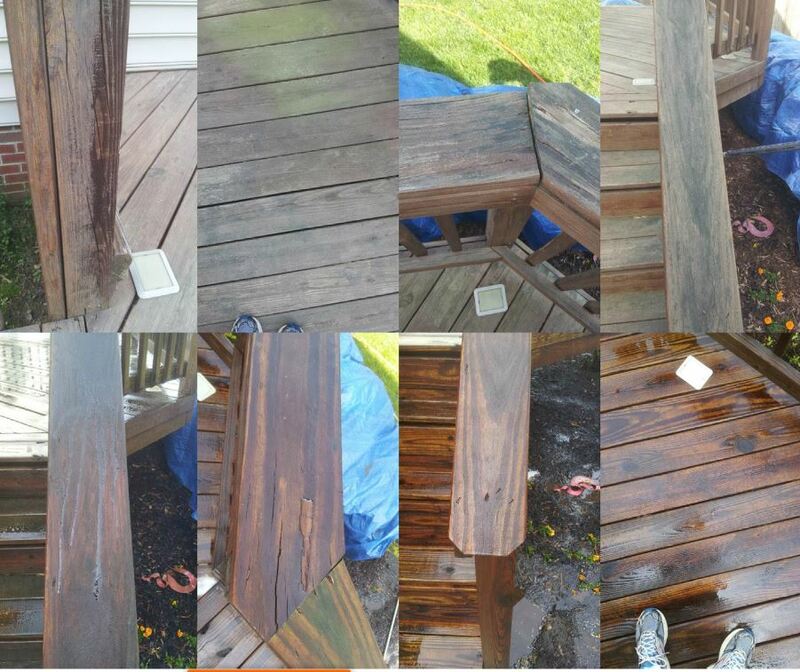 This deck is on the north side of a house and doesn’t get much sunlight, resulting in both mildew and algae growth. It had an acrylic or latex stain on it that had been peeling off. 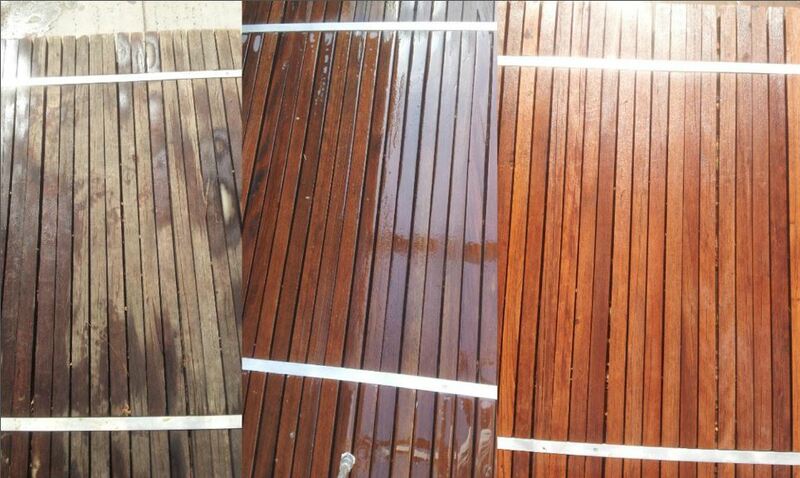 We used a sodium hydroxide mix and light power washing to strip the remaining stain off. Afterwards, there was still some algae and mildew on it and we had to spot treat with bleach (with some scrubbing) to finish the cleaning. After the prep process was completed we still finished it off with a light sanding. The alternative to sodium hypochlorite is sodium percarbonate. Typically these cleaners claim to treat mold and mildew. However, the majority of the feedback I’ve received from wood restoration professionals – and from my own experience – is that at best they will work in this capacity only if there is light growth, but not for heavier concentrations. Generally, these formulas provide inferior results for killing mold, mildew, and algae compare to sodium hypochlorite, but superior cleaning results without the need for scrubbing. If you have had great results killing mold with these cleaners, disregard what I have said. I am a big believer in “if it’s not broke, don’t fix it.” It could be that your overall environment allows for better results than what I and those I know have experienced. Here is a perfect example for this application. The stain on the mahogany was no longer intact. There was no visible mildew growth and so it was treated with sodium percarbonate, rinsed with a light power wash without the need for any scrubbing, and then brightened. If you were looking for an easier and cheaper way to accomplish a similar result, I imagine you could go with a cleaner with oxalic acid in it. 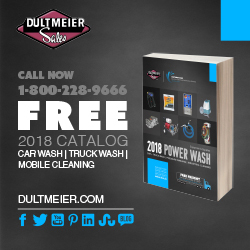 Typically, these cleaners are more for the homeowner looking for the easy, “good enough” approach to cleaning while restoration professionals use a two-step process for better overall cleaning and brightening. So when do we need to clean with sodium hypochlorite? For starters, any wood like the first illustration where there is little or no evidence of a prior stain intact. You can also mix in some Jomax if you have concerns with bleach or if the mildew/algae really has a hold on the wood. We have found this is very popular in wet areas like the Pacific Northwest. 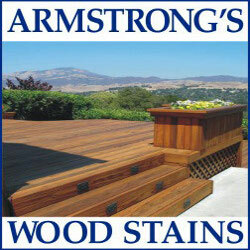 Secondly, there are a few quality softcoat stains on the market that do not require the use of strippers. Although liquid bleach isn’t the most environmentally-friendly product, it is less harsh than a lot of strippers needed to remove other stains. Many wood restoration professionals may stick with strippers or sodium percarbonate, but these stains do make prep easier, especially for homeowners doing this on their own. On a final note, I would like to offer this perspective when it comes to using liquid bleach. To over simplify my prior career, I spent 13 years working with printers and color management. When we look at a printed image in, say, a magazine, it often looks like a photograph. In reality, it is really an illusion created by printing a series of very tiny dots, in varying size, in four colors, at different angles. Professionals look at these dots through loupes (magnifying glasses) and discuss, sometimes argue, what needs to be done to print a better dot. Meanwhile the printed image looked great. In much the same way, using a two percent sodium hypochloride solution may technically do some damage to wood, but if you don’t let it sit too long and the damage is negligible, does it really matter? Most wood restoration professionals finish their prep with a light sanding anyway which would most likely remove this minimal amount of damage. Now if you let the solution sit too long, then yes, Houston we have a problem. Brian Carter spent over 13 years in printing and packaging working with design and color, including three years working with the Lowe’s Home Improvement account for a very large packaging company. He then took a hiatus from corporate America and ran a financial planning practice. In 2015, Brian and his family moved from Denver, NC to Sonora, CA, where he now serves as the Vice President for Armstrong Clark.